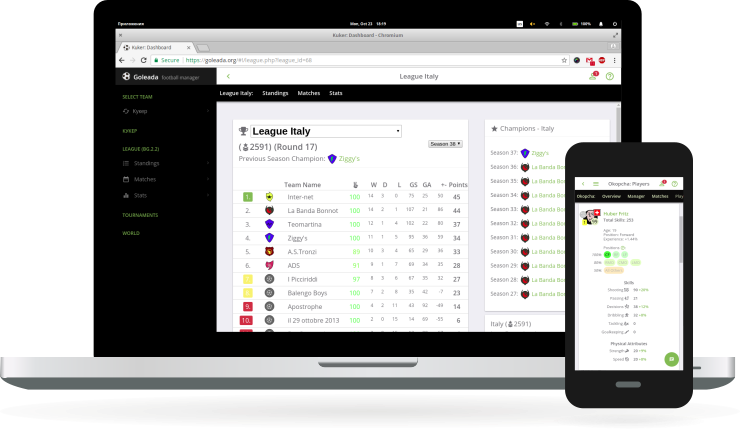 Are you interested in an online, multiplayer football management game with strategy and tactics? Do you have an ambition to compete with managers from all around the world? Are you patient? Can you plan and build long-term? Goleada is a browser based game - no installation(s) needed. Compatible with different devices and screen sizes. You just need an internet connection and nothing else. Many games declare that they are free to play, but in fact you can't proceed to the highest level without buying coins, plugins, or anything similar. Most of them are full of ads, making the gameplay really annoying. Goleada is really free to play. There is no Pay to Win involved. No Ads. A supporter package is included but doesn't give any in-game advantages. You are able to compete with or without it. But thanks to the supporters, we can have this fair play. The match engine calculates the match before and at the start of a game. The "Live" is just watching this already finished game and recorded log, receiving messages from time to time. The LIVE is live, the game is played on the same time. You can change tactics, make substitutes in lineup or give orders to the team. The games are exciting and full of suspense. A player in a certain position contributes with his individual skills to the overall team sector (attack/defence/etc). These cumulative sectors are compared with the corresponding opposite zones in a limited number of game-chances. The game is simulated all over the match-time, according the players positions and skills. The player induviduality matters, he is not acumulated with the others. One player can make the difference, but it is a team game - he cannot win alone. The core of the game is the match - the players on the field. Team &amp; Individual instructions, substitutes and orders during the game. 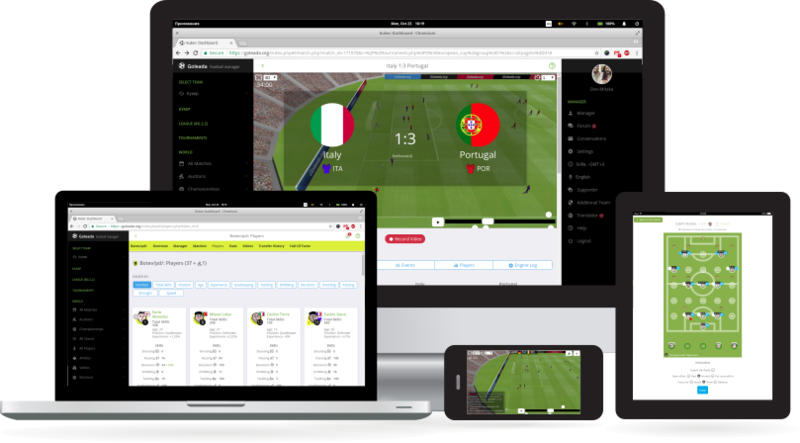 Fast and Lightweight 3D Viewer (phones and tablets supported), 2D Player for Older Devices and After Match Analysis. Match Log for all the players decisions and duels during the game. A lot of Statistical data. In contrast of the other games, players have only 9 skills. Training options are simple, but every skill (tackling, shooting etc.) could have a big effect on the performance of a player. There are Superstars and many talented players. Players that could make a difference in every match. All and all is a very simple game to start. Slow pace but with quick seasons. It's a mix of a FB fast paced game with old school long term, slow paced manager games. Half an hour a week is enough to support your team. But if you wish you can spend many hours a week. To reach the highest levels of the game, patience is needed. But if you like strategy, maths, probabilities and thinking - this game is for you. Clubs are playing in National &amp; Regional Leagues, Every Season the best participate in International Tournaments. Competions for National Teams. Everyone could be elected as NT manager. Matches almost every day, the Season is about a month. Very simplified economy. No ice cream and T-shirts, no buildings upgrades, and so on. Goleada is Sport Manager, not Hoarding game. Every team earns as much as the others, and have equal chance of catching up the dominators and to become a big team. Thanks to Supporters we can run this game. They pay the bill for servers and development. Vital for the game and all other managers. Play Smart! Be a Champion!